What is Ebb Insomnia Therapy? Ebb Insomnia Therapy is the first and only FDA-cleared insomnia prescription device that reduces the time it takes to both fall asleep and enter deep, restorative sleep. 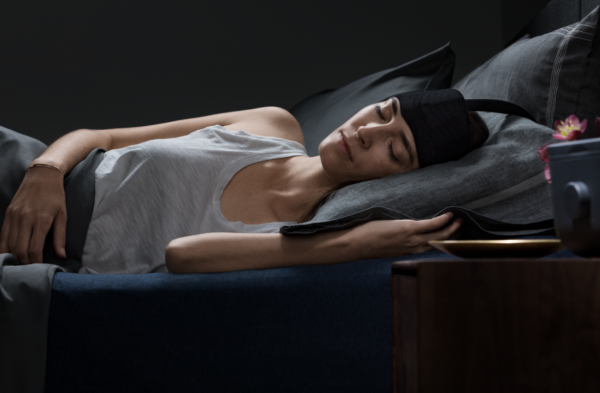 It is a wearable insomnia therapy that comfortably cools your forehead, helps quiet the racing mind and enhances your ability to sleep so you can get the rest you need to take on tomorrow. How can I get Ebb Insomnia Therapy? You will first need to see a sleep specialist to determine if you are an Ebb Insomnia Therapy candidate and to learn more about this treatment option. If you are a candidate, you can try Ebb Insomnia Therapy for free in one of our hotel-like rooms. It will take between 30 to 60 minutes to demonstrate, allow you to take a 20 minute nap, and answer any questions. You can determine if you would like to purchase it or try it out for free for 30 days at home. If you want to have Ebb Insomnia Therapy at home for a free 30-day trial, your provider will write you a prescription for it, which we send to Ebb. Ebb will then contact you to send you the machine and supplies. If you decide to purchase Ebb, it can be purchased off the company website or by calling Ebb Customer Service: 800-381-1145. Ebb Insomnia Therapy is a prescription-only, FSA/HSA eligible device. It is not covered by insurance. To schedule an appointment with a sleep specialist, call (585) 385.6070, the location nearest you or contact us. You can also visit ebbsleep.com for more information.